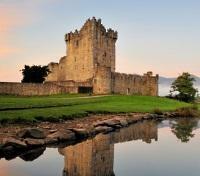 Be dazzled by the rugged and dramatic Ring of Kerry. 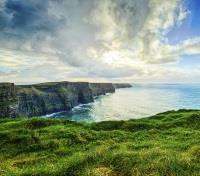 Enjoy a private guided visit to the beautiful Cliffs of Moher. 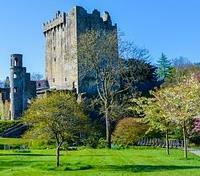 Kiss the magical stone at the famous Blarney Castle. Set out with a guide to explore the stunning Dingle Peninsula. Start your Irish journey with a drive through The Burren in County Clare, an otherworldly limestone biosphere where a large collection of alpine and Mediterranean species grow together. The Burren is bordered to the west by the Atlantic Ocean and Galway Bay and is tucked in the north-west corner of Clare, and with its Cliffs of Moher, is one of the most beautiful locations in the country. Take in the famous Ring of Kerry on your way to he charming town of Killarney, then venture through the stunning Dingle Peninsula. Continue your journey to Cork and visit the legendary Blarney Castle before making your way east to Waterford and its magnificent crystal offerings. 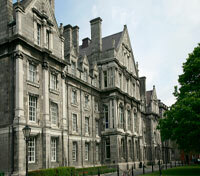 End your visit to Ireland in its fair capital of Dublin with a city tour of its elegant Georgian squares, beautiful parks, including a visit to see The Book of Kells in Trinity College. Discover Ireland with a private driver-guide, featuring experienced driving skills and expert local knowledge and insight into the best towns, monuments and historic sites of the Emerald Isle. In addition to your pre-booked customized touring, get recommendations on where to shop, have a drink, grab a bite, and even lesser-known sites typically ignored by visitors, all of which you can stop to visit on a whim (payable on the spot), because your days have built-in flexibility. 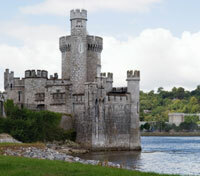 Enjoy an introduction to Ireland with such depth and quality that's only possible with a local expert. Simply the best and most enjoyable way of seeing the Emerald Isle, in style! Meet your awaiting private driver-guide for an airport transfer, checking in at your hotel (time permitting) before heading out to explore the Burren and Cliffs of Moher, a UNESCO Global Geopark in West Clare, ranked at the top of Ireland's most rugged and dramatic landscapes with shifting and sculpted stone creating unforgettable scenery you won't want to miss. Discover the quaint and picturesque seaport villages of Kinvarra and Ballyvaughan, the former of which will allow you to catch views of the 16th century Dunguaire Castle, one of the most photographed castles in all of Ireland. In Polnabrone, head out across a rocky, glacio-karst field worn away by ancient glaciers to view an impressive neolithic portal tomb, called the Poulnabrone Dolmen, a stone burial monument erected by some of the very first settlers to this remote, pitted landscape over 5,200 years ago. On arrival to visit the Cliffs of Moher, you'll head out along the pathways, walking to various viewing platforms for different lookout points out across what is easily one of Ireland's most iconic views - offering moments of contemplation and awe, as you gaze out across sheer, eroded cliffsides which drop dramatically down 700 feet to the North Atlantic below. Conclude your day back in Newmarket on Fergus. 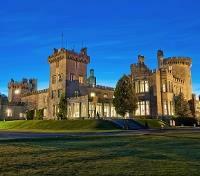 Ireland’s most magical address, Dromoland Castle has been welcoming guests since the 16th century. 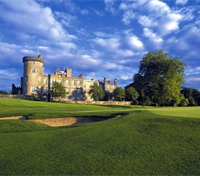 The ancestral home of the O’Briens of Dromoland, whose lineage dates back 1,000 years to Brian Boru, one of the last High Kings of Ireland, Dromoland Castle has got nobility and hospitality in its DNA. Approached by a meandering drive that passes acres of magnificent lawns, this re-imagined luxury castle hotel overlooks its own Championship Golf Course and a glistening lake which commands the panoramic beauty of the surroundings. Seamlessly blending Old World elegance with contemporary luxuries, the Dromoland's tradition of delivering impeccable, unobtrusive service is never compromised. Guests can relax under the careful attention of the staff and enjoy an exquisite selection of fine gourmet dining and delicious wines, unwind slowly in the Castle's first class spa or indoor heated pool, and of course take comfort in one of Dromoland's lavish guestrooms or suites. Setting out today with your private driver-guide, embark on a discovery of one of Ireland’s loveliest regions, the famed Ring of Kerry. Poets, painters, writers and musicians have all tried to convey the beauty of the Ring, with mountains, valleys, and lakes, blending into a palette of scenic splendor. Leaving Newmarket on Fergus, you’ll transfer to Killarney, approximately 2 hours away, where your true adventure begins. A cornerstone of the Ring of Kerry, your day will include a visit to Muckross House, a magnificent Victorian mansion and one of Ireland’s leading stately homes. The elegantly furnished rooms portray the lifestyle of the landed gentry, while downstairs in the basement one can experience the working conditions of the servants employed in the house. You’ll travel through Molls Gap, a scenic mountain pass through the Macgillycuddy’s Reeks, and Ladies View, offering a majestic viewpoint across Killarney National Park, then continue along the broad, dramatic coastline of the Iveragh Peninsula and through the charming villages and towns of Killorglin, Cahirsiveen, Waterville and Sneem. Time permitting, you can stop and walk out to view the impressive ancient stone ring forts of Cahergal and Leacanabuaile, dating back to around 600AD, in addition to catching majestic viewpoints of the ever-changing Atlantic coastline all throughout your day. The Killarney Park Hotel is one of the finest luxury hotels Ireland has to offer, minutes from town life and nature's wonderful attractions alike. Perfectly located in the very heart of Killarney town center, set in mature grounds and framed by the legendary surroundings of Killarney National Park, this is a luxury hotel really like no other. Old-world elegance meets modern day luxury in this family-owned hotel, where you can look forward to the solace and comfort from a real log fire, first class dining, a lavish spa and wellness center, and the very best of Irish hospitality. Recently garnering the "Number One Hotel in Ireland" accolade by Trip Advisor, this proud Leading Hotel of the World offers a warm and welcoming retreat for guests in search of exceptional comfort with all of those little extra touches. Depart Killarney and head northwest with your private driver-guide for a day of exploration in the Dingle Peninsula, where you can admire wild ocean scenery, ancient relics and a profusion of every sort of color blossoming in the hedgerows. Here, the ever-changing landscape shifts from from mountains and rolling hills to coastlines of craggy cliffs and sandy beaches. Head first to one of such beaches, known as Inch Beach, a scenic spot for a stroll to admire its sandy dunes and coast framed by a beautiful mountain backdrop. Upon reaching the town of Dingle, join up with the Slea Head Drive, a scenic circuit on the peninsula which will bring you directly to Slea Head itself for a remarkable view, a majestic promontory jutting out into the wild waters of the Atlantic. 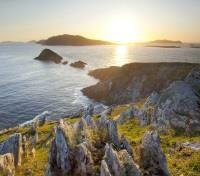 Look out over the Blasket Islands as you stand at arguably the westernmost point of mainland Europe. Continuing along, make a stop at the ancient early Christian ruins of the Reasc Monastery at Ballyferriter, featuring an important carved stone dating back to the 6th century. Later you'll exit the western peninsula via the dramatic Conor Pass, Ireland's highest mountain pass, with a narrow, twisting road snaking past a remarkable glacial landscape of mountains, valleys, and corrie lakes. There are countless optional stops along the way, including the curious ancient Fahaan Beehive Huts, or for the seafaring type, perhaps a ferry ride out to the Blasket Islands. In order to give as much flexibility as possible, entrance fees for optional stops are not included and can be paid on the spot. Enjoy beautiful views of the bucolic West Cork coastline as you transfer from Killarney to Cork today with your private driver-guide. Head to Glengariff, located at the foot of the Caha Mountains that separate Cork from Kerry, a dense lush sub-tropical valley with beautiful natural scenery. Inland from here is the solitary chapel on an island by the lake at Gougane Barra, one of Ireland's most romantic locations. In Baltimore, you can walk out to the intriguing Lot's Wife, a white stone beacon with a stunning coastal view out across to the adjacent Sherkin Island. Along the coast, you'll get to stop at the quaint fishing villages of Glandore and Union Hall as well as an optional detour to Ireland's most southerly peninsula, Mizen Head. Among the highlights as you continue your day, is a stop at the ancient Drombeg Stone Circle, also known as the Druid's Altar, a 2,000 year-old megalithic stone circle which evokes thoughts of very different time. Just outside of Cork, you'll get to visit the picturesque 15th century ruins of Blarney Castle, where legend has it a kiss of the Blarney Stone bestows the kisser the gift of the gab. 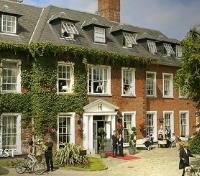 At day's end you will arrive to your accommodation in Cork for check-in. Hayfield Manor is a family-owned boutique luxury hotel, nestled within beautiful walled gardens, providing a tranquil oasis in the vibrant city of Cork. Pamper yourself with a choice of elegant guestrooms, all individually styled and designed with your comfort in mind. From antique furnishings to exquisite fabrics, your surroundings retain the distinct magical charm of a proper manor house, while first class service ensures every detail during your stay is attended to. Unwind in the Manor’s signature restaurant which overlooks the beautiful private gardens, or relax the mind, body and soul at the luxurious spa, offering indulgent treatments to soothe your senses. Embark on a full day transfer from Cork to Dublin with your private driver-guide, stopping en route in the historic city of Waterford, the approximate midpoint of your route, nearly 2 hours away from each location. 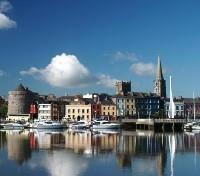 Waterford is the oldest city in the Republic of Ireland, being founded by the Vikings back in the year 914. See the thousand-year-old Reginald's Tower in the Viking Triangle, and witness ancient segments of what is considered the country's largest collection of medieval defensive walls. Beyond ancient relics, Waterford is also well known as the source of Waterford Crystal, and you'll get to visit the wonderful House of Waterford Crystal, a facility which has been producing beautiful decorative and functional glassware for over a century. Enjoy the scenic views throughout the day as you journey onward toward Dublin, where your day concludes. 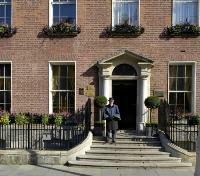 The Merrion, in the heart of Dublin city center, is the capital's most luxurious hotel, and a proud member of The Leading Hotels of the World. Located a few minutes' walk from the shops of Grafton Street, the hotel's 142 stunningly appointed guestrooms and suites are as welcoming as they are stylish. An impeccable restoration of four Georgian townhouses, The Merrion is a marriage of exquisite comfort, relaxed elegance and advanced guest facilities, including a lavish spa, complimentary wifi internet, a 2-Michelin star restaurant, and an intimate cocktail bar. A recipient of many prestigious awards and accolades, The Merrion prides itself on the cornerstone of its success: excelling in the art of hospitality. 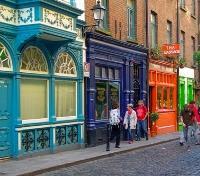 Meet your private guide at your hotel and set out on foot for a half-day walking tour of Dublin, exploring the highlights of the lively Irish capital. Stroll through the landscaped grounds of St Stephen’s Green, a public park dating back to 1664, followed by a walk through Merrion Square, with its impressive red brick Georgian townhouses. Stroll past the historic Dublin Castle, former seat of the English, along with the Lords and Kings of Ireland, now used for all State ceremonial events. Pass by Christchurch, built by the Anglo-Norman’s in 1172 to replace an earlier Church built by the Vikings in 1038. No visit to Dublin would be complete without a visit to St Patrick’s Cathedral, a highlight of your tour. Built in 1192, it is one of Ireland’s largest cathedrals, made famous by its former dean Jonathan Swift, author of Gulliver’s Travels. 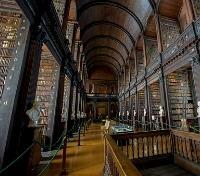 Check out the old cobbled lanes and hip establishments of Temple Bar, Dublin’s cultural quarter, and visit Trinity College where you’ll be able to see the 8th century Book of Kells, perhaps the world’s most beautifully illustrated book and gaze upon the 200,000 books of the long room. Conclude your tour back at your hotel. Enjoy an afternoon at leisure, spending your time as you wish, perhaps visiting one of Dublin's many famous attractions, such as the Guinness Storehouse or the Jameson Distillery, both offering a unique view into the history and production of these famous Irish exports, with the experience generally wrapped up with a delicious sample of the product. 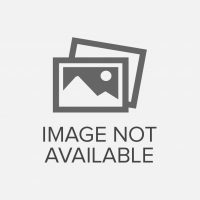 If you're in the mood for shopping, the world-famous Grafton Street is probably where your time is best spent, though Nassau Street and O'Connell Street are suitable alternatives as well.